The reasons for reading are as many as there are words on a page. When I read, I feel that I am allowed access to a space that is unlike any other. I read other people’s voices on the page, screen, or cereal box. It doesn’t matter. I am a strong reader. And because I am a strong reader, I am a strong thinker. I want you all to be strong thinkers, too. 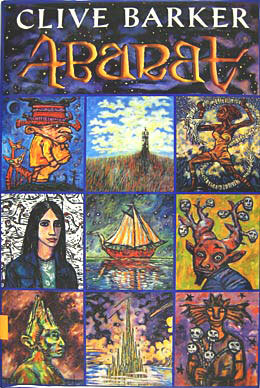 Arabat is an amazing book. Every time I read it, I feel as if I’m stepping into another world–that’s such a cliche to say, but Barker’s writing style creates a visual and textual world that I literally can almost reach out and touch. The salt air, fear, flying, hope, courage, and barnacles are so perfectly paced, described, and not overdone; I could only aspire to write such as he. His original illustrations leave me in awe. His villains are complex, cruel, and like all good villains (nice oxymoron, eh?) they want to destroy the light: one with creating a perpetual midnight, the other with creating a world of mindless purchasing and consuming zombies. Whew. That was a ramble. How did I go from admonishing you to read to writing a brief review of Arabat? I guess the real question is, how would I not? P.S. This book is out of print now. My quest? To seek as many copies I can. That was exactly how I felt when I read that book and how I feel every time I read!